Points Nécessaires : 25300 Software is not compatible with mobile and tablet devices. Please add this title to your Wish List and sign on to your the first club account from a desktop computer to complete your redemption. 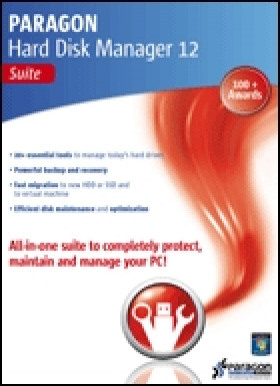 ABOUT PRODUCT Why Hard Disk Manager Suite? 20+ Premium Tools in One suite Everything you need to re-structure your hard disk for optimal, effective usage Protect your important data with the ability to restore your system to exact former settings Make your system bootable - even on different hardware Take advantage of SSD drives Get the most from a virtual environment Secure wi… pe functions ensure you never leave sensitive data in the wrong handsFull Range of Disk Mangement	Advanced partitioning tools gain maximum performance of your hard drives Automatic alignment significantly boosts your PC performance Multiple operating systems (up to 16) can be managed on one hard drive Fastest Migration Perform everyday migrations with ease: upgrade your hard drive, migrate to new hardware or use your old PC in a virtual environment Move any Windows OS since XP from a regular hard disk to a faster SSD, even of smaller capacity Supports all the latest HDD standards Complete Backup Protect your entire PC, including the operating system, applications, your settings and all data files, with high-level backup tools Safeguard your system while it is up and running Automate backup routines by scheduling operations Restore the entire disk’s contents in minutes - no reinstallations require	Advanced Recovery	Start the recovery process during startup of your computer, even if your operating system has failed Create a safe, bootable backup capsule for disaster recovery Start up your system on a different hardware platformEasy Virtualization	Make a virtual clone of your old system before migrating to a new computer Restore a previous virtual environment after unsuccessful virtualization of your system Supports major virtual machines, including Oracle VirtualBox 4Secure Wiping Wipe exactly what you need - whether it’s a separate partition or an entire hard disk Two wiping algorithms destroy all on-disk data, providing the maximum level of securityTECHNICAL DATA Supported Operating Systems Windows 8 (32/64-bit) Windows 7 (32/64-bit) Windows Vista (32/64-bit) Windows XP Professional (32/64-bit) Windows XP Home Edition SP2 Windows XP Professional SP2/SP3 (32/64 Bit)	Supported Virtual Machines Oracle VirtualBox Microsoft Virtual PC VMware Workstation VMware Fusion	Supported HDD Interfaces	Parallel ATA (IDE) Serial ATA (SATA) External SATA (eSATA) HDD SCSI iSCSI Solid State Drive (SSD) Advanced Format Drive (AFD) 2TB+ Drives Non-512B Sector Size Drives All levels of SCSI, IDE and SATA RAID controllers Full support of RAIDed configurations (hardware RAIDs) IEEE 1394 (FireWire) USB 1.0/2.0/3.0 Support of MBR- and GPT-formatted Drives PC card storage devicesSupported CD/DVD and other Removable Media Formats CD-R CD-RW DVD-R DVD-RW DVD+R DVD+RW DVD+/-R (DL) BD-R BD-RE Support for ZIP®, Jazz® and other removable media	Supported File Systems* NTFS (v1.2, v3.0, v3.1) FAT16 FAT32 Linux Ext2FS Linux Ext3FS Linux Ext4FS Linux Swap Apple HFS+ Other file systems (in the sector-by-sector mode)	*Encrypted volumes are not supported. System Requirements	CPU: Intel Pentium CPU or its equivalent, with 300 MHz (1000MHz for Windows PE Recovery CD) or higher processor clock speed RAM: 256 MB required (512 MB for Windows PE Recovery CD**) Disk space: 390 MB*** Internet Explorer 5.0 or higher Mouse SVGA video adapter and monitor Extra: CD/DVD/BD Drive **WinPE boot media can be created with the help of Paragon Boot Media Builder. ***During the installation additional free space (up to 1GB) will be required.